Social Security Benefits: When to Start Receiving Retirement Income? Social Security benefits are an amazing source of retirement income that adjust for cost of living and are guaranteed for the rest of your life – no matter how long you live. It is no wonder that most people are anxious to start taking Social Security as soon as they are eligible. In fact, two thirds of Americans start taking Social Security early at age 62. However, for most people, the best way to maximize your Social Security is to delay starting it. 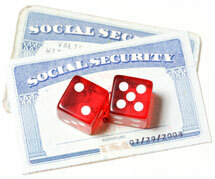 It is possible to begin Social Security benefits as early as age 62. However, your monthly payments will increase if you defer the start of your benefits until a later age. In fact, if you wait until age 70 to start Social Security, your monthly benefit could be more than double what it was at 62. Is Social Security Enough for a Secure Retirement? Use the NewRetirement Calculator to find out about your Social Security options and what you really need for a secure retirement!